Russian rabbi; born in Koidanov, government of Minsk. 1814; died at Plungian, government of Kovno, Nov. 14, 1861. He was a descendant of Rabbi Yom-Ṭob Lipmann Heller. Jehiel was successively rabbi at Glusk (1836-43), Volkovisk (1843-54), Suwalki, and Plungian (till his death). He was a noted preacher, and delivered sermons in pure German on various notable occasions. 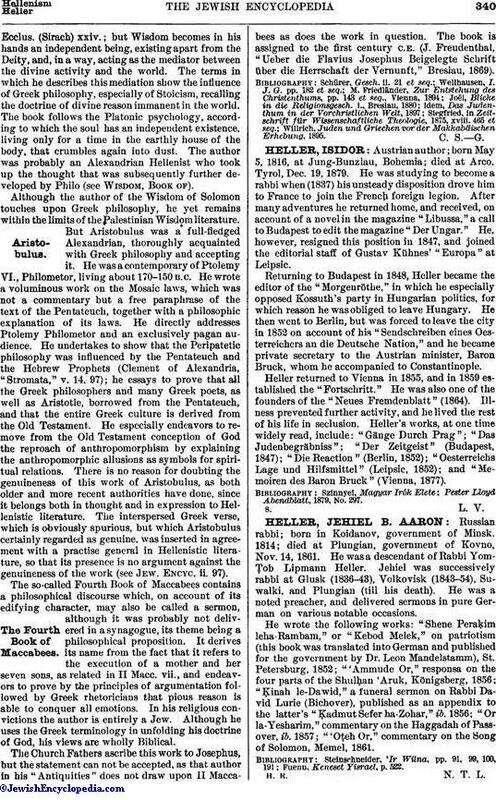 He wrote the following works: "Shene Peraḳim leha-Rambam," or "Kebod Melek," on patriotism (this book was translated into German and published for the government by Dr. Leon Mandelstamm), St. Petersburg, 1852; "'Ammude Or," responsa on the four parts of the Shulḥan 'Aruk, Königsberg, 1856; "Ḳinaḥ le-Dawid," a funeral sermon on Rabbi David Lurie (Bichover), published as an appendix to the latter's "Ḳadmut Sefer ha-Zohar," ib. 1856; "Or la-Yesharim," commentary on the Haggadah of Passover, ib. 1857; "'Oṭeh Or," commentary on the Song of Solomon, Memel, 1861. Fuenn, Keneset Yisrael, p. 522.